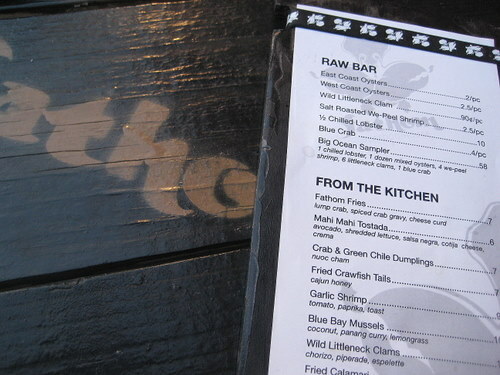 I had another chance for outdoor dining when we stopped by Fathom Seafood. They have some picnic tables outside, and we were lucky to snag the last one. We ended up letting a german couple share our table and we had an interesting discussion about Frankford Hall around the corner. Plus, they had an adorable puppy. I’m a big fan of Fish, and I plan on getting to Little Fish as soon as humanly possible, so I was happy to check out their latest and casual spot. K’s fish and chips special. A few hunks of fried fish, some hush puppies, and fries. What’s not to like? 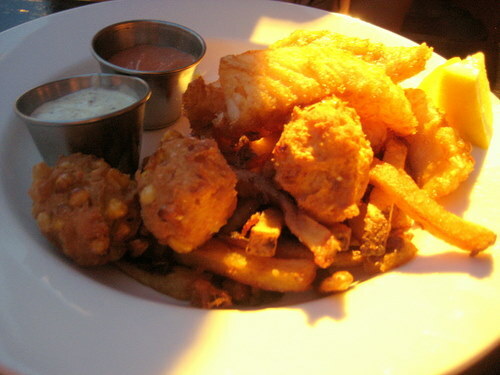 The fish was hot and the batter light and flaky and I thoroughly enjoyed the fries. This wasn’t overly greasy. 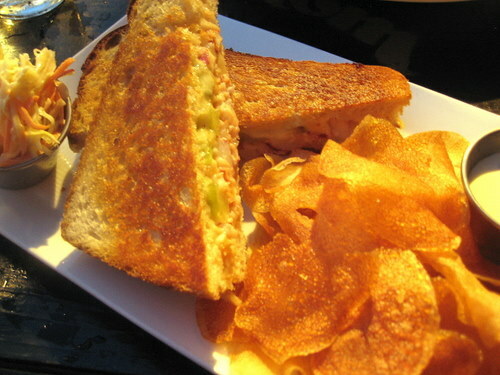 I went with the lobster grilled cheese on sourdough with fontina cheese, green tomato, and truffle oil. It’s served with what seems to be homemade chips and cole slaw. Now this, this was a bit too much for me. It was way too rich for my weenie palate and it was also a bit too greasy for me. I liked it enough, especially the green tomato, which were a nice touch, but it was just too much. And the chips were greasy too which just added to the too muchness of the sandwich. But we had a lovely time here and the outdoor dining was perfect for this evening. Service was great!